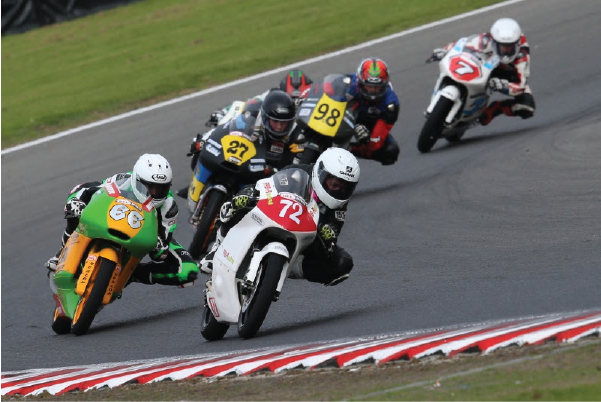 Lewisham teenager Cameron Horsman took his first win and a fourth place of the 2016 Hel Performance Motostar Championship at Brands Hatch this weekend, and moved to within 14 points of the Standard Moto3 Championship lead. Following his first podium of the season last time out at Oulton Park, Cameron Horsman headed into his home round at the Brands Hatch Indy circuit looking for more of the same. The weekend got off to a great start for the youngster after posting a 51.975 in Friday morning’s free practice, after notching up 31 laps in the 20-minute session, leaving him the second standard moto3 machine, only seven hundredths of a second behind the fastest standard class man Dan Jones. The afternoon’s qualifying session would see Cameron improve in time by two tenths of a second, however he dropped down the standings due to others improving their times. Q2 on Saturday would see the Lewisham man improve on his time by six tenths of a second, and leapfrog the pack ahead to line up in 20th place on the grid, with a time of 51.154, only one tenth behind Dan Jones the who set pole for the standard class. After minor changes to his machine in the short break between qualifying and the sprint race, Cameron headed into 16 lap dash confident of achieving his first win of the season. From the lights the teenager got a great leap and led the standard Moto3 race, and was mixing it with many Moto3 GP riders. Cameron continued the control the race throughout the 16 laps, making a break from second place standard man TJ Toms at the end, setting the fastest standard lap on his second to last circulation, and took the flag in first place, and 18th overall. By virtue of his lap time from Saturday’s race, Cameron would start Sunday’s feature race from 17th on the grid, and as the pole man in the standard Moto3 class. As the lights went out Cameron got a tough start and found himself back in fourth of the standard class race. The Lewisham man was then embroiled in a battle with Mark Clayton for third and then with seven laps to go, three other riders joined the fight for the final podium spot. He dropped back as far as sixth place in the standard race, but then made his way back up to fourth and in search of Storm Stacey who occupied third. He made his way past on the final lap, but was pipped in the drag to flag by Stacey, meaning Horsman would take fourth. Cameron now sits in third place of the Hel Performance Standard Moto3 Championship standings on 58 points, only 14 behind leader TJ Toms. The fourth round of the season will take place in four weeks’ time in the Scottish Highlands at the circuit of Knockhill on the weekend of the 24th/25th/26th June. 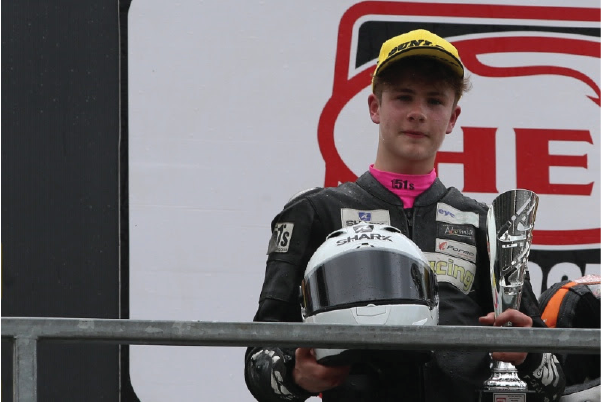 Lewisham’s Cameron Horsman achieved his first podium of the season at Oulton Park this bank holiday weekend, battling the elements and technical problems, but he overcame them on Bank Holiday Monday standing on the second step of the podium. Determined to make a mends after a pointless start to the season at Silverstone, the Lewisham based teenager started his weekend off well. Cameron on a very wet circuit flew out of the blocks in the first free practice, posting a 2:07.1, meaning he would be the quickest out of the standard moto3’s by seven hundredths of a second from Thomas Strudwick, and only eight seconds behind the fastest man on circuit, that of Mike Brouwers on factory machinery. In Saturday afternoon’s second free practice session the track was drying but damp in certain places, meaning Cameron had to be careful not to crash. However, the maturity of the teenager shone as he rode round well working hard on his setup as he went, posting a 1:54.9, leaving him the fifth fastest standard moto3 ahead of qualifying on Sunday. After overcoming technical issues with the ECU, Cameron headed out for the second qualifying session on Sunday high in confidence, and that showed as he eventually qualified in 15th place, and the third standard moto3 posting a time of 1:54.3, only 1.9 second slower than the top standard class machine. Come Monday’s race, and after overnight changes to the machine Cameron got a great leap from the line battling straight away for the lead of the standard class with Asher Durham. Horsman swapped places every lap with Durham, even coming close to banging elbows showing true grit to get the win. Cameron didn’t give in, and was just beaten to the line by one tenth of a second by Durham, meaning Horsman would take second place, and a valuable 20 points to his title challenge. Horsman now sits in seventh place of the championship standings on 20 points, only 16 behind leader Storm Stacey. Cameron will now head to the Brands Hatch Indy circuit on the weekend of the 20th/21st/22nd May for round three of the championship.